Popular desktop virtualization client Parallels released an update to their desktop app for Mac on Wednesday, allowing Apple developers to run beta versions of OS X Mavericks in tandem with older versions of the Mac operating system. Parallels Desktop 8 for Mac has been updated to version 8.0.18494, giving developers more flexibility to test their apps in Mavericks, without needing to dedicate an entire machine to a potentially buggy beta build of the operating system. Parallels 8 also allows any user to run a virtualization of other popular operating systems such as Googles Chrome, Linux and Windows 8. While Parallels 8 does not support Mavericks as a new, blank virtual machine (VM), users can alter an existing VM to run the developer versions. To enable this feature, simply update to the latest build of Parallels before opening an existing VM running OS X. Then, take a snapshot of the VM to prevent any data loss and increase the video memory to 128 MB in that bank. Once the Developer Preview of Mavericks is installed it can be run on the same machine as current builds of Snow Lion or other versions of OS X. 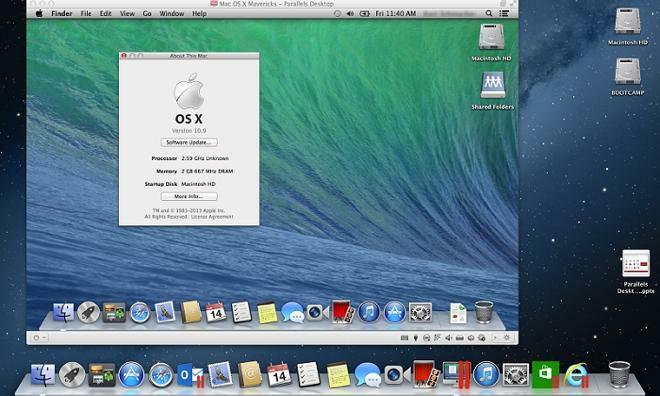 Developers running Parallels 8 for Mac have been attempting to run Mavericks as a VM since the first beta build were released during this years WWDC, but many were unable to do so. The new update to the software brings what the company calls "experimental" support for developer builds of Mavericks, and should resolve some of the issues developers faced in recent weeks. The last major update to Parallels Desktop 8 came last November, when the software was given expanded support for Microsoft's latest Windows 8 platform. The update also gave users the ability to use Mountain Lion's Dictation feature in Windows applications. Parallels Desktop 8 launched last September, boasting 30 percent faster 3D graphics, and a 25 percent faster startup for Windows. The release also added support for Apple's MacBook Pro Retina displays, and is optimized to work with OS X 10.8 Mountain Lion.